You know what makes the long grey days of winter in the Rockies better? A book about two friends jetting off to Hawaii. 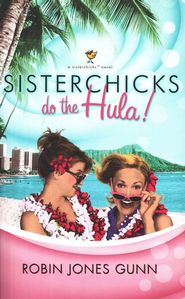 SisterChicks do the Hula , by Robin Jones Gunn was just the answer to those winter blues. SisterChicks do the Hula follows two lifelong friends, now in their 40's as they search for where they fit as life transitions. One is surprised by an unexpected pregnancy and the other struggles with embracing her natural gift of photography. As these two faith filled women spend time on the island, they find a renewed sense of purpose and faith in a good Father who gives good gifts. The book is filled with laughter, sincerity and left me longing for a trip to Hawaii! It helped me appreciate the dear friendships I have and look forward to a time when I can meet up and celebrate the joy of friendship with my own bestie. If you are looking for a light, fun, inspiring read, pick up a copy of Sisterchicks Do the Hula, or any of the Sisterchicks books, by Gunn. You won't be disappointed. In partnership with the Blogging for Books program I was provided a free copy of Sisterchicks in return for my honest review. I promise, I really did like the book. P.S. This book is on sale for a whopping $2.99 right now. It's a smoking deal! If you like my book reviews, please go rate them here!